Sugarbush Vermont is authentic Vermont, like a postcard in winter. Perhaps you’ve seen the Clydesdale ad, with the horse drawn sleigh gliding over fresh sparkling snow. That popular clip was filmed in the beautiful Mad River Valley. The setting of rolling snow-covered mountains, the church steeples and quaint New England storefronts, is only one reason to go. Two big ski mountains on one ticket, Glen Ellen or Mt Ellen at 4,083′ and Lincoln Peak at 3,975′, is another reason. 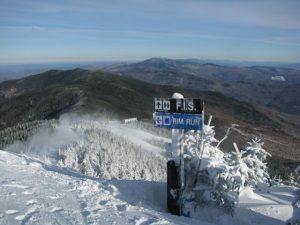 Sugarbush’s skiing is vast, the only Eastern resort to offer first tracks cat skiing in their 2,000-acre backcountry Slide Brook area, often with the resort owner Win Smith or extreme film skier John Egan who both ski daily at The Bush. Sugarbush is a great choice for a family ski vacation. 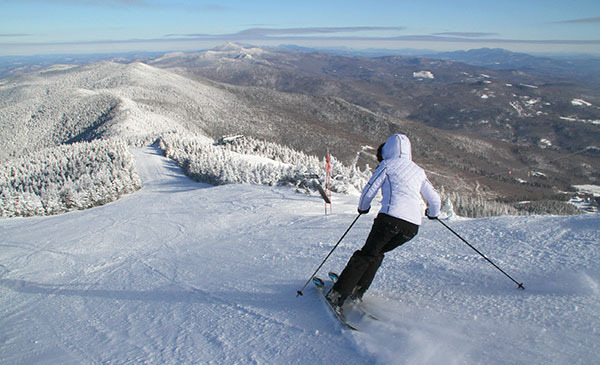 Sugarbush offers great ski and snowboard lessons and mini bears and sugar bears camp for kids, which operate out of the Lincoln Peak Schoolhouse, part of the quaintly designed and compact Lincoln Peak base village. 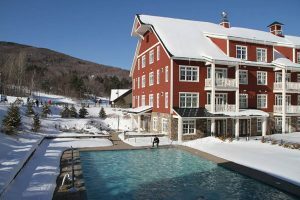 The scenery is beautiful, the on slope Clay Brook Inn, as seen on the Today Show, is perfectly situated in the heart of Lincoln Peak village. Park your car underground, walk to ski school, the shops, the outdoor heated pool and ski valet, lunch and dinner at the casual Castlerock Pub, or Rumble’s in the timber frame round house, and breakfast at the Skinny Pancake are all steps away. 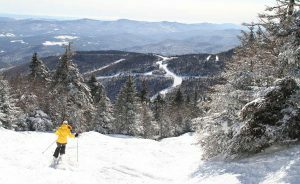 Its a well-thought Vermont ski destination – with terrain to satisfy everyone from 30% groomed runs on the Gatehouse and Super Bravo lifts, to hearty all-natural Castlerock and the steeps of Mt Ellen’s FIS and Exterminator. In 2015, the Valley House Double at Lincoln Peak wass replaced with a new Valley House Quad and a Gadd condo development offers new on slope condos. We still prefer the Clay Brook best for its proximity to the lifts, and also the skier services and village, plus the Inn’s outdoor heated pool and hot tubs..
During your Sugarbush ski vacation, you may want to ski the classic Mad River Glen nearby on the “Ski The Valley Plus” ticket, no snowboarders are allowed at MRG and the summit lift is a single chair – very retro. The Mad River Valley has a classic Vermont town with charming inns like The Pitcher Inn and The Inn at Round Barn Farm, quaint covered bridges and country stores galore.